The NSW Environment Protection Authority (EPA) has completed its statutory review of the Environment Protection Licences (licences) held by Sydney Water Corporation (Sydney Water) for the operation of its sewage treatment systems. Under section 78 of the Protection of the Environment Operations Act 1997 the EPA is required to undertake a five year statutory review of each licence. Sydney Water holds 23 licences for the sewerage systems it owns and operates across the Sydney, Illawarra and Blue Mountains areas. The sewerage system includes the network of sewer pipes, sewage pumping stations and sewage treatment plants which treat the collected wastewater (including from homes and businesses) before being re-used or discharged to rivers or oceans. Through these licences, the EPA regulates both Sydney Water's sewage treatment plant discharges and discharges from the sewage reticulation system. These licences specify environmental performance requirements, generally negotiated with Sydney Water, taking into account factors such as the likely impact of activity on the environment including the surrounding environmental conditions and best available technology. The EPA reviews and makes changes to the licences on an ongoing basis to address issues as they arise. 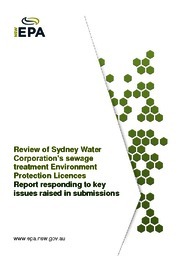 The focus of the 2015 licence review was to seek community feedback and invite written submissions from all interested stakeholders on Sydney Water's licences. The EPA received 48 submissions in relation to the 2015 Sydney Water sewage treatment system licence review from a range of stakeholders, including local residents, community and environmental groups, councils/council groups and government agencies. The EPA has reviewed and considered all the submissions received during the licence review consultation period. The EPA's response to submissions report can be downloaded: Report responding to key issues raised in submissions received by EPA in relation to the 2015 review of Sydney Water Corporation's sewage treatment system environment protection licences (PDF 326KB). The submissions received by the EPA covered a wide range of issues including specific concerns about certain licences, general issues applicable to a number of licences and EPA's regulation of Sydney Water's operations. Some issues raised were outside the licensing framework or were considered to be whole-of-government issues. It has not been possible to address every issue raised by stakeholders in this response document. The EPA intends to raise the specific issues outlined in the submissions directly with Sydney Water; many are complex, requiring long term actions, and either are/ or will need to be considered further within the EPA's strategic work program with Sydney Water. If required, licences will be amended as issues are addressed. The EPA has prepared a fact sheet providing an overview of Sydney Water's environment protection licences (PDF 75KB), including the key environmental performance requirements contained in these licences. Copies of Sydney Water licences can be viewed, printed or obtained from the EPA's Public Register. A list of the licences for Sydney Water's sewage treatment systems can be seen below. This list can assist you in determining the licence that operates in your local area and/or is relevant to you. You will need the licence number to search the public register to see a copy of the licence.